Why Do High Protein Foods Help Decrease Appetite? Recent studies have shown that high-protein diets may reduce hunger and appetite, and could make you thinner. Food temptation is everywhere, and people are looking for ways to resist falling for their cravings when they are not hungry. Recent studies have shown that high-protein diets may reduce hunger and appetite, and could make you thinner. Scientists from the University of Washington, School of Medicine investigated whether increasing the protein content while maintaining the carbohydrate content of the diet contributes to weight loss by reducing appetite and unplanned caloric intake. 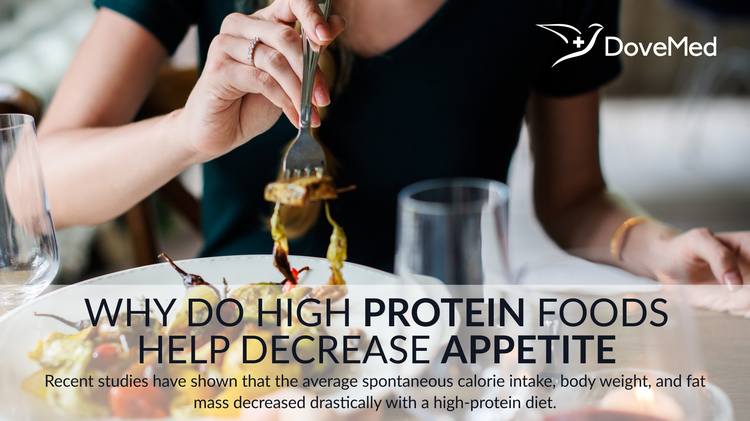 They found that the average spontaneous calorie intake, body weight, and fat mass decreased drastically with a high-protein diet. These results occurred despite a significantly reduced level of leptin, the fullness hormone, and an increased the level of ghrelin, the hunger hormone. In a mouse study, published in Cell Metabolism, the research suggests that a protein-rich diet may be a great approach to lose weight and keep it off. Mice that ate protein-dense food produced higher levels of the appetite-regulating hormone peptide YY. In addition, these mice had less fat on their bodies than mice that ate low-protein diets. Human studies associated peptide YY with a reduced appetite. A Nature paper explored the relationship between peptide YY and one’s taste using a mouse study. Dr. Batterham and her colleagues found similar results that mice fed with protein-rich diets gained less weight than mice fed with low protein diets. After, they investigated further into this relationship and genetically-engineered mice, so as to lack a functioning peptide YY. These genetically engineered mice had more fat, even on a high-protein diet. Batterham emphasizes that high-protein diets will require further investigation to see if they carry risks of high cholesterol, kidney damage, or other problems. Many people have looked to whey protein specifically for an extra boost in their exercises. This protein craze exists because our bodies quickly digest and absorb whey protein, stimulating muscle protein synthesis. The flooding of amino acids may also suppress appetite. A multi-experimental study suggests that whey protein, when eaten before a meal, reduces overall food intake during the meal. The study confirms this effect and provides extra awareness into how much whey protein is required to produce a fat-reduction effect. Since it is known that a high-protein diet reduces appetite, try adding whey protein to a fruit shake to create a smoothie. Excellent selections of fruits and vegetables include bananas, berries, and spinach, which add dietary fiber and may increase the feeling of fullness, and in return, curb your appetite. Other foods that have extra fat, such as nuts and coconut, may also help fill you up. Astbury, N. M., Stevenson, E. J., Morris, P., Taylor, M. A., & Macdonald, I. A. (2010). Dose–response effect of a whey protein preload on within-day energy intake in lean subjects. British journal of nutrition, 104(12), 1858-1867. Batterham, R. L., Cowley, M. A., Small, C. J., Herzog, H., Cohen, M. A., Dakin, C. L., ... & Bloom, S. R. (2002). Gut hormone PYY3-36 physiologically inhibits food intake. Nature, 418(6898), 650-654. Batterham, R. L., Heffron, H., Kapoor, S., Chivers, J. E., Chandarana, K., Herzog, H., ... & Withers, D. J. (2006). Critical role for peptide YY in protein-mediated satiation and body-weight regulation. Cell metabolism, 4(3), 223-233. Weigle, D. S., Breen, P. A., Matthys, C. C., Callahan, H. S., Meeuws, K. E., Burden, V. R., & Purnell, J. Q. (2005). A high-protein diet induces sustained reductions in appetite, ad libitum caloric intake, and body weight despite compensatory changes in diurnal plasma leptin and ghrelin concentrations.The American journal of clinical nutrition, 82(1), 41-48. Weigle, D. S., Breen, P. A., Matthys, C. C., Callahan, H. S., Meeuws, K. E., Burden, V. R., & Purnell, J. Q. (2005). A high-protein diet induces sustained reductions in appetite, ad libitum caloric intake, and body weight despite compensatory changes in diurnal plasma leptin and ghrelin concentrations. The American journal of clinical nutrition, 82(1), 41-48.